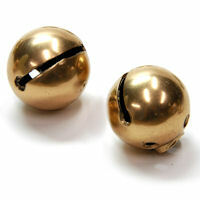 The curvaceous globe bell is another common horse-bell design. They appear to have been popular in the late 1800s and early 1900s. The original manufacturers called this a "globe" or "arctic" bell. According to an article published in 1884, the globe bell design was patented by W.E. Barton, a prolific inventor and innovator in the sleigh bell industry. (1) Based on our observations of the many styles of globe bells, it is clear that other companies soon followed Barton's lead by creating their own variations of the globe bell. The most common style of globe bell looks like a small egg laid by a pullet (young hen), with a rounded base and gently pointed top. The "pointed" globe bell is an elongated oval that comes to a much sharper point. The "round" type of globe bell is ... well ... round -- or spherical to be more precise. 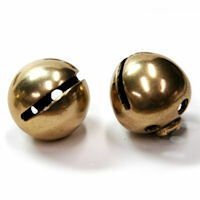 Globe bells all have one throat with no holes at the ends, four holes circling the base, and a rivet-style base. More about rivet-style bells... These bells were often nickel plated, although this plating is mostly gone on many of the bells we see. Sizes range from 1 1/8 to 1 3/8 inches in diameter, measured across the middle. 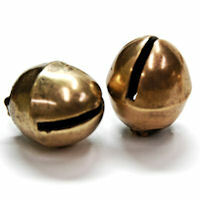 Globe bells were usually attached 2 to 3 inches apart in a single row on a leather body strap roughly 1 inch wide. The pointed egg bells were typically spaced closer together than pullet or round bells.